I absolutely love Mexican food and think it's easy to adapt Mexican recipes to be vegetarian or even vegan. This is one of my favourite recipes that I go back to again and again. It's inspired by a couple of different recipes I have found online and through friends, but I've simplified it a bit. Next time you are feeling like Mexican, give the chicken fajitas a miss and try this recipe as a delicious, veggie alternative. 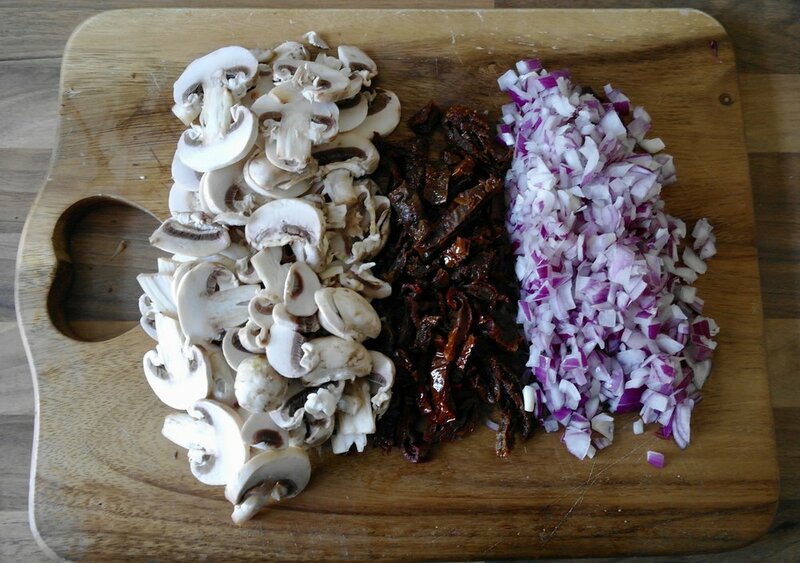 Chop the onion, sun-dried tomatoes, garlic and mushrooms. Add to a frying pan with the cayenne pepper, cumin and chilli and cook for 5 minutes (or until ingredients are cooked). You shouldn't need any extra oil, due to the oil from the sun-dried tomatoes, but add more if needed. Add the black beans to the frying pan and cook for a further 5 minutes. Season well with salt and pepper. In a seperate bowl, prepare the avocado by blending or mashing it until it is a consistency you like. Chop the tomato and add to the avocado. Juice the 1/2 lime and mix with the avocado. Season well. Remove the black bean mixture from the frying pan and set aside. Add more oil to the frying pan and place one tortilla in the pan. (The frying pan should be big enough for the tortillas!). Add the black bean mixture on top and spread it out evenly over one half. Fold the tortilla over to create your quesadilla. Carefully check the tortilla every so often to see if it's ready to be flipped. Once golden brown, flip the quesadilla over to cook the other side. Once both sides are cooked, remove from the frying pan and serve with the fresh avocado, sour cream and coriander. Repeat steps 5 & 6 for each quesadilla. Enjoy!